How do you get from A to B? What happens along the way? Join Dance Troupe Practice and SiteFactory for a one day exhibition of works created over one month. This event showcases pieces exploring mapping, photography, sound and drawing by Pandora Park Fieldhouse artists Mirae Rosner, Emiko Morita and prOphecy sun, made in collaboration with community members. As part of a series of events throughout October for Vancouver's Big Draw Festival, Dance Troupe Practice artists have navigated through the sounds and textures of the outdoors with creative mapping, discovered new ways to illuminate and map invisible elements of community through photography, and explored textural soundscores using pedals, tapes, voices and small instruments to tell the story of journeys through the world. 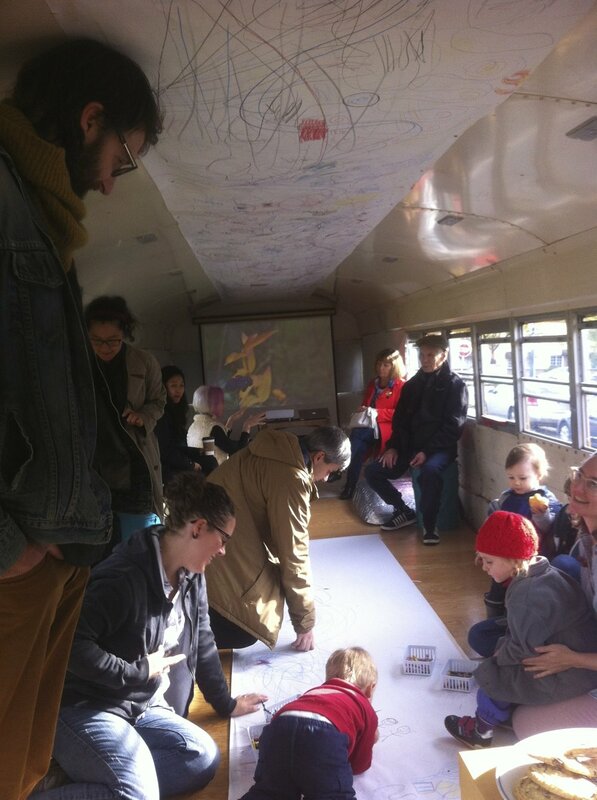 The final exhibit and closing party for Between A and B is hosted in the SiteFactory bus at Pandora Park. Dance Troupe Practice is a movement-based performance collective founded in 2007 in Vancouver, Canada. They produce interdisciplinary works that combine dance, sound, voice, video and installation. Their works are grounded on a philosophy that explores the border zones between dance and life. They are committed to the deep exploration of embodiment, movement inquiry and to each individual's dancing body. Dance Troupe believes that powerful new dance works emerge from the commitment to a collective process and each member's personal body communication, without necessarily following a rigid palette of dance techniques.